We’re here to help you find the health insurance you need, no matter where you live or what time of day and our services are always free. We can help you save money on your student health insurance. We have all the top carriers. Be protected in the event of an illness or injury. Get coverage outside of open enrollment. You will not find a better price anywhere. Search through all of the top carriers in the nation. Be protected in the event of an illness or injury. Get coverage outside of open enrollment. Open enrollment begins in May and continues through September for students beginning the school year in fall. Make sure you get your coverage now before time runs out! Even if you're a physical specimen, you're gonna get sick at some point. Be prepared for when that day comes by getting the right coverage at the right price. Get started now. 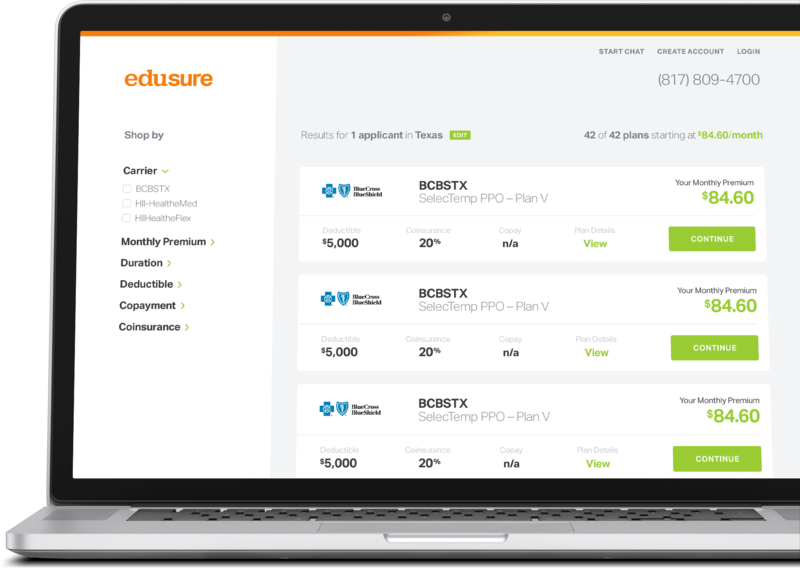 "I loved the recommendations and support that I got from edusure. They helped simplify the confusing world of health insurance." "This is a classy, creative, entrepreneurial launch by you and your company. It is an example of why you are so successful in the student health insurance brokerage world. Thanks for providing this assistance for our domestic students." Copyright © 2019 edusure, Inc.